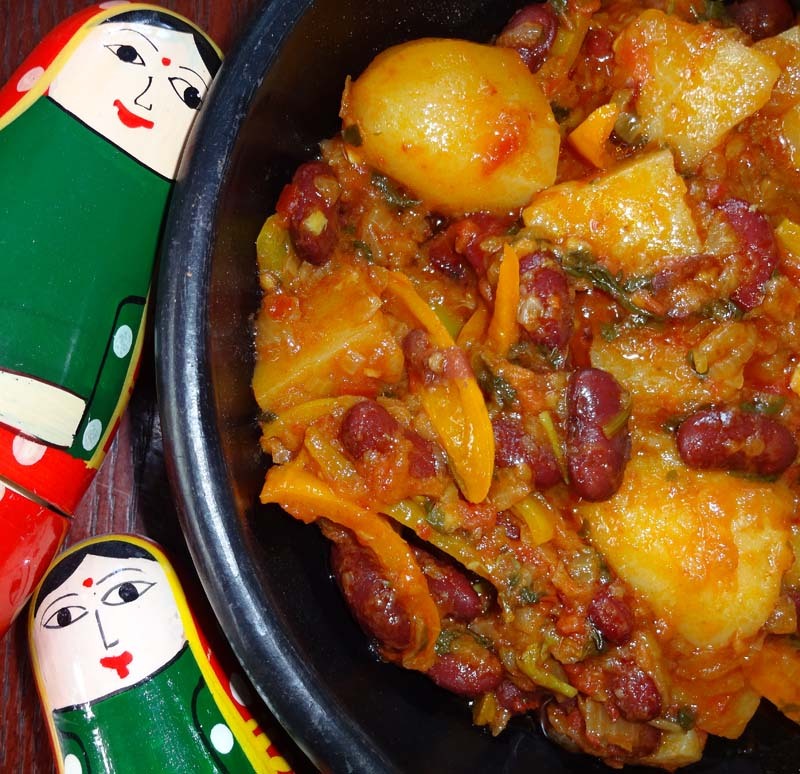 Those of you who have been fortunate to travel to India will have undoubtedly tried a vegetarian Indian Kidney Bean Curry known as Rajma, especially in Northern Parts of India. 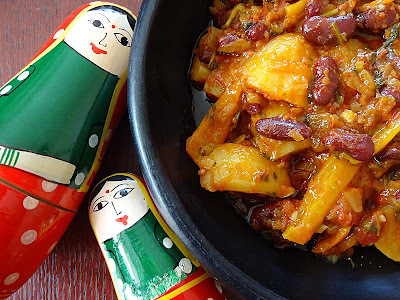 I actually made this Kidney Bean Curry a couple of weeks ago, when my husband brought home some baby orange and yellow peppers, so I added these and some potatoes to the pot, because of these additional vegetables I am not going to call this a Rajma Curry - Red Kidney Bean Curry will just have to suffice. If you like vegetarian chilli pots then I know you will like this. The kidney beans just melt in your mouth. I am sharing this autumnal red dish Four Seasons Food 'Sliding into Autumn' theme. Four Seasons Food hosted by Anneli of Delicieux and Louisa at Chezfoti. Serves 6 as an accompaniment to rice or Indian style bread like naan. In a large wide pan, heat the oil then add the minced onions, garlic and ginger and cook until transparent, add the spices and cook until the oil rises to the surface. Add the tomatoes and cook until well integrated. Then add the potatoes first, cook for about ten minutes, then add in the peppers and cook until the vegetables are tender. Keep stirring to stop the vegetables from sticking to the pan, when vegetables are cooked, stir in the beans and 150ml - 250ml water to the pot, bring to the boil, let it simmer until the flavours have infused into the water. Garnish with a little sprinkling of garam masala. One of my all-time favourite Indian recipes is one called "Punjabi beans" - 5 different types of bean cooked with ghee. Fab with chappatis. I agree fab with chappati's. YUM!! I love curry so much, this looks amazing! Thank you so much Anneli. I think you will like this, my husband tends to snub his nose but when he dives in the plate always comes back clean.